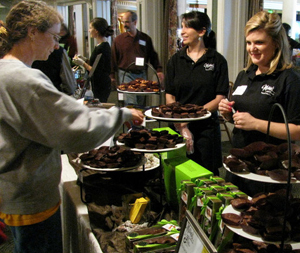 Chocolate Festival devotees will have an abundance of selections from which to choose. Here Marini's Candies displays its wares at the 2010 festival. In its first three years, this family-friendly event has raised more than $40,000 for scholarships for re-entry students returning to higher education after an extended absence. In addition to chocolate tastings, chocolate gift items sure to please any valentine will be on sale, and drawings will be held for many exciting, chocolate-themed and other special door prizes. The jazz trio Hold Tight will perform. Local celebrity chef Jake Gandolfo of Felton will be on hand to sign copies of the new MasterChef Cookbook, which includes some of his recipes. Bay Tree Bookstore will have copies for sale, and UCSC Dining and Catering will prepare samples of Gandolfo’s chocolate cupcakes. Participating businesses include Ashby Confections, Bay Tree Bookstore, The Buttery, Cabrillo College: Culinary Arts and Hospitality Management, Chefany's Cake Shoppe, Chocolate: the Restaurant on Pacific Avenue, Chocolate Visions, CJ's Stix & Bitz, Cocoanut Grove Banquet & Special Events, Cold Stone Creamery, Desperately Seeking Chocolate, Lifestyle Culinary Arts, Little Sky Lavender, Marini's Candies, Monterey Bay Baking Company, Original Sin Desserts, OZ Lounge, Pacific Cookie Company, Pele's Oven, Robyn’s Chocolates & Confections, Shaman Organic Chocolates, Snake and Butterfly, Somersault Snack Co., Sterling Confections, Theo Chocolate, UCSC Dining and Catering, Whole Foods Market of Santa Cruz, Woodworm Party Store, and Xocai Antioxidant Chocolate. Tickets are $5 for 3 tastings, $10 for 8 tastings, and $20 for 20 tastings and are available at Bookshop Santa Cruz, the Bay Tree Bookstore at UC Santa Cruz, and at Norrie’s Gift Shop at the UCSC Arboretum. Remaining tickets will be available at the door on the day of the event. About the UCSC Women’s Club: The UCSC Women’s Club is a non-profit organization that raises scholarship funds to benefit students who are returning to college. Membership is open to all. During the past 30 years, the UCSC Women’s Club has awarded 294 scholarships totaling $178,242 to deserving women and men for research activities, tuition, and childcare.